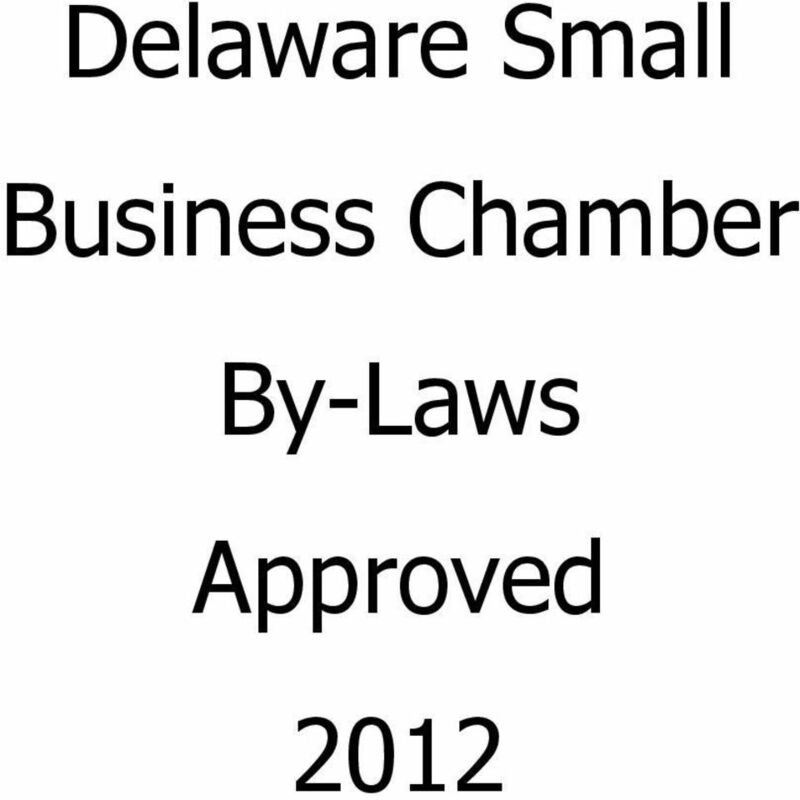 Download "Delaware Small Business Chamber By-Laws Approved 2012"
4 Delaware Small Business Chamber By-Laws ARTICLE I (General) SECTION 1 - NAME This organization is incorporated under the Laws of the State of Delaware and shall be known as the Delaware Small Business Chamber hereafter referred to as the Chamber. SECTION 2 - PURPOSE OF THE ORGANIZATION The Chamber, a business organization, is organized to advance and protect the general welfare and prosperity of the small businesses and those doing business with small businesses in the State of Delaware and surrounding area so that the business community and its citizens shall prosper and to serve as a first call resource and business trade organization with local, regional, national and international reach. SECTION 3 - AREA SERVED The Delaware Small Business Chamber shall serve businesses throughout the State of Delaware well as other surrounding jurisdictions that have an economic or social inter-relationship in or with the area. SECTION 4 LIMITATIONS The Chamber shall observe all local, state and federal laws. The Chamber shall be nonpartisan and shall not endorse any candidate. ARTICLE II (Membership) SECTION 1 - ELIGIBILITY Any business firm, individual, association, corporation, partnership or estate having an interest in participating in and furthering the purposes of the Chamber shall be eligible to apply for membership. SECTION 2 - ELECTION Application for membership shall be in writing on the forms specified. Upon approval, memberships will begin upon payment of the prescribed membership investment. SECTION 3 - INVESTMENT Membership investment shall be at such rate or rates, schedules or formulas as may be adopted by the Board of Directors. 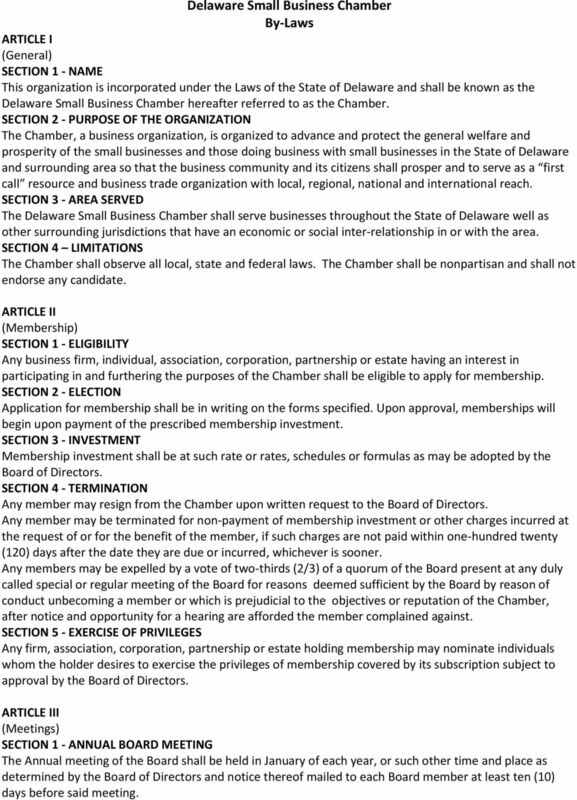 SECTION 4 - TERMINATION Any member may resign from the Chamber upon written request to the Board of Directors. Any member may be terminated for non-payment of membership investment or other charges incurred at the request of or for the benefit of the member, if such charges are not paid within one-hundred twenty (120) days after the date they are due or incurred, whichever is sooner. Any members may be expelled by a vote of two-thirds (2/3) of a quorum of the Board present at any duly called special or regular meeting of the Board for reasons deemed sufficient by the Board by reason of conduct unbecoming a member or which is prejudicial to the objectives or reputation of the Chamber, after notice and opportunity for a hearing are afforded the member complained against. SECTION 5 - EXERCISE OF PRIVILEGES Any firm, association, corporation, partnership or estate holding membership may nominate individuals whom the holder desires to exercise the privileges of membership covered by its subscription subject to approval by the Board of Directors. ARTICLE III (Meetings) SECTION 1 - ANNUAL BOARD MEETING The Annual meeting of the Board shall be held in January of each year, or such other time and place as determined by the Board of Directors and notice thereof mailed to each Board member at least ten (10) days before said meeting. 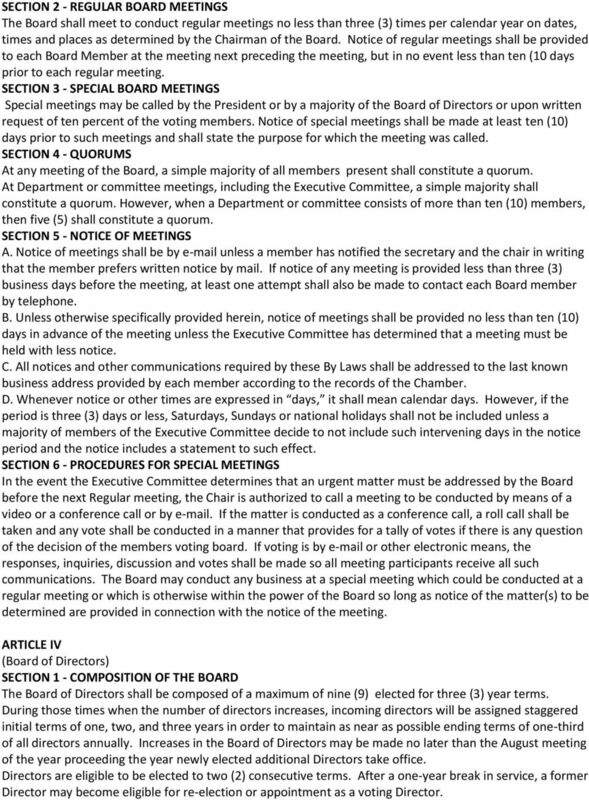 5 SECTION 2 - REGULAR BOARD MEETINGS The Board shall meet to conduct regular meetings no less than three (3) times per calendar year on dates, times and places as determined by the Chairman of the Board. Notice of regular meetings shall be provided to each Board Member at the meeting next preceding the meeting, but in no event less than ten (10 days prior to each regular meeting. SECTION 3 - SPECIAL BOARD MEETINGS Special meetings may be called by the President or by a majority of the Board of Directors or upon written request of ten percent of the voting members. Notice of special meetings shall be made at least ten (10) days prior to such meetings and shall state the purpose for which the meeting was called. SECTION 4 - QUORUMS At any meeting of the Board, a simple majority of all members present shall constitute a quorum. At Department or committee meetings, including the Executive Committee, a simple majority shall constitute a quorum. However, when a Department or committee consists of more than ten (10) members, then five (5) shall constitute a quorum. SECTION 5 - NOTICE OF MEETINGS A. Notice of meetings shall be by unless a member has notified the secretary and the chair in writing that the member prefers written notice by mail. If notice of any meeting is provided less than three (3) business days before the meeting, at least one attempt shall also be made to contact each Board member by telephone. B. Unless otherwise specifically provided herein, notice of meetings shall be provided no less than ten (10) days in advance of the meeting unless the Executive Committee has determined that a meeting must be held with less notice. C. All notices and other communications required by these By Laws shall be addressed to the last known business address provided by each member according to the records of the Chamber. D. Whenever notice or other times are expressed in days, it shall mean calendar days. However, if the period is three (3) days or less, Saturdays, Sundays or national holidays shall not be included unless a majority of members of the Executive Committee decide to not include such intervening days in the notice period and the notice includes a statement to such effect. SECTION 6 - PROCEDURES FOR SPECIAL MEETINGS In the event the Executive Committee determines that an urgent matter must be addressed by the Board before the next Regular meeting, the Chair is authorized to call a meeting to be conducted by means of a video or a conference call or by . If the matter is conducted as a conference call, a roll call shall be taken and any vote shall be conducted in a manner that provides for a tally of votes if there is any question of the decision of the members voting board. If voting is by or other electronic means, the responses, inquiries, discussion and votes shall be made so all meeting participants receive all such communications. The Board may conduct any business at a special meeting which could be conducted at a regular meeting or which is otherwise within the power of the Board so long as notice of the matter(s) to be determined are provided in connection with the notice of the meeting. ARTICLE IV (Board of Directors) SECTION 1 - COMPOSITION OF THE BOARD The Board of Directors shall be composed of a maximum of nine (9) elected for three (3) year terms. During those times when the number of directors increases, incoming directors will be assigned staggered initial terms of one, two, and three years in order to maintain as near as possible ending terms of one-third of all directors annually. 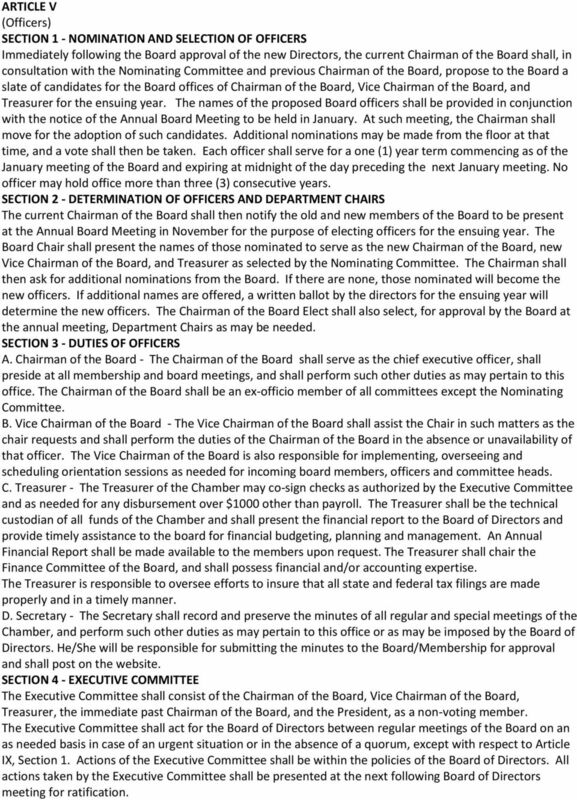 Increases in the Board of Directors may be made no later than the August meeting of the year proceeding the year newly elected additional Directors take office. Directors are eligible to be elected to two (2) consecutive terms. After a one-year break in service, a former Director may become eligible for re-election or appointment as a voting Director. 6 Up to two (2) non-voting Ex-Officio Board members may be selected each year at the November meeting. Exofficio members are to be selected from entities and organizations deemed by the board to provide the chamber key links to the community. It shall be the duty of the Board to attend meetings, conduct Chamber business, be faithful in attendance at board meetings, participate in Chamber functions, serve on committees and be willing to undertake such other duties to further the purpose of the chamber. Each director s term shall commence as of the January meeting of the board and expire at the end of their three (3) year term at midnight of the day preceding the next January meeting. 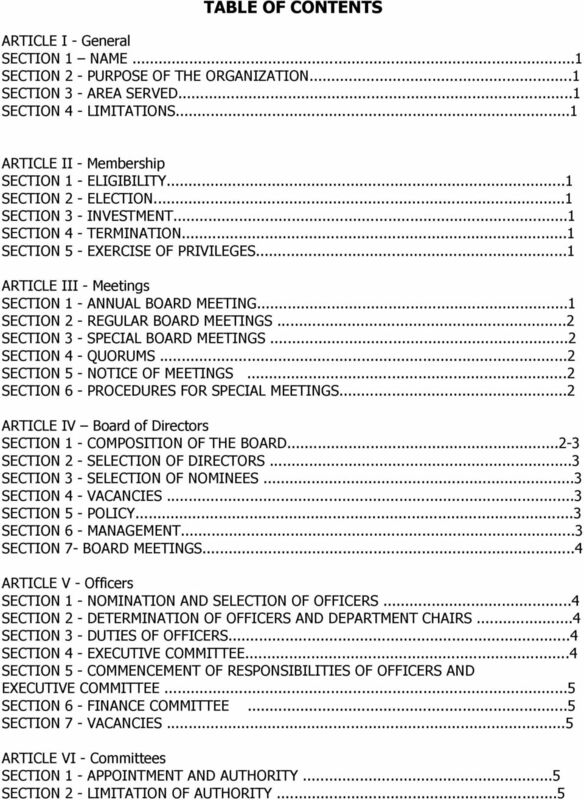 If any member of the Board of Directors misses two (2) consecutive meetings or a total of four (4) meetings during the twelve (12) months preceding each January 31, the member shall be notified immediately in writing by the secretary of the Board, and if a satisfactory excuse is not received at the next Board of Directors meeting that individual shall, upon a vote of a simple majority of the members present, cease to be a member of the Board. The vacancy thus created shall be filled as provided in these by laws. SECTION 2 - SELECTION OF DIRECTORS At the October Board meeting, the Chairman of the Board shall present to the Board of Directors for approval a slate of five (5) members in good standing to serve as a Nominating Committee. The committee shall elect a Chairman of the nominating committee. 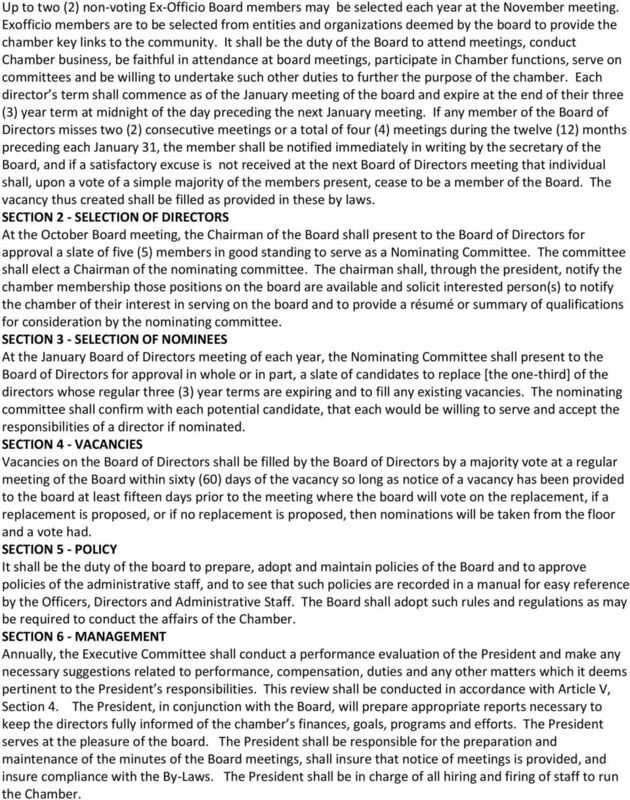 The chairman shall, through the president, notify the chamber membership those positions on the board are available and solicit interested person(s) to notify the chamber of their interest in serving on the board and to provide a résumé or summary of qualifications for consideration by the nominating committee. SECTION 3 - SELECTION OF NOMINEES At the January Board of Directors meeting of each year, the Nominating Committee shall present to the Board of Directors for approval in whole or in part, a slate of candidates to replace [the one-third] of the directors whose regular three (3) year terms are expiring and to fill any existing vacancies. The nominating committee shall confirm with each potential candidate, that each would be willing to serve and accept the responsibilities of a director if nominated. SECTION 4 - VACANCIES Vacancies on the Board of Directors shall be filled by the Board of Directors by a majority vote at a regular meeting of the Board within sixty (60) days of the vacancy so long as notice of a vacancy has been provided to the board at least fifteen days prior to the meeting where the board will vote on the replacement, if a replacement is proposed, or if no replacement is proposed, then nominations will be taken from the floor and a vote had. SECTION 5 - POLICY It shall be the duty of the board to prepare, adopt and maintain policies of the Board and to approve policies of the administrative staff, and to see that such policies are recorded in a manual for easy reference by the Officers, Directors and Administrative Staff. The Board shall adopt such rules and regulations as may be required to conduct the affairs of the Chamber. SECTION 6 - MANAGEMENT Annually, the Executive Committee shall conduct a performance evaluation of the President and make any necessary suggestions related to performance, compensation, duties and any other matters which it deems pertinent to the President s responsibilities. This review shall be conducted in accordance with Article V, Section 4. The President, in conjunction with the Board, will prepare appropriate reports necessary to keep the directors fully informed of the chamber s finances, goals, programs and efforts. The President serves at the pleasure of the board. The President shall be responsible for the preparation and maintenance of the minutes of the Board meetings, shall insure that notice of meetings is provided, and insure compliance with the By-Laws. The President shall be in charge of all hiring and firing of staff to run the Chamber. 7 ARTICLE V (Officers) SECTION 1 - NOMINATION AND SELECTION OF OFFICERS Immediately following the Board approval of the new Directors, the current Chairman of the Board shall, in consultation with the Nominating Committee and previous Chairman of the Board, propose to the Board a slate of candidates for the Board offices of Chairman of the Board, Vice Chairman of the Board, and Treasurer for the ensuing year. The names of the proposed Board officers shall be provided in conjunction with the notice of the Annual Board Meeting to be held in January. At such meeting, the Chairman shall move for the adoption of such candidates. Additional nominations may be made from the floor at that time, and a vote shall then be taken. Each officer shall serve for a one (1) year term commencing as of the January meeting of the Board and expiring at midnight of the day preceding the next January meeting. No officer may hold office more than three (3) consecutive years. SECTION 2 - DETERMINATION OF OFFICERS AND DEPARTMENT CHAIRS The current Chairman of the Board shall then notify the old and new members of the Board to be present at the Annual Board Meeting in November for the purpose of electing officers for the ensuing year. The Board Chair shall present the names of those nominated to serve as the new Chairman of the Board, new Vice Chairman of the Board, and Treasurer as selected by the Nominating Committee. The Chairman shall then ask for additional nominations from the Board. If there are none, those nominated will become the new officers. If additional names are offered, a written ballot by the directors for the ensuing year will determine the new officers. The Chairman of the Board Elect shall also select, for approval by the Board at the annual meeting, Department Chairs as may be needed. SECTION 3 - DUTIES OF OFFICERS A. Chairman of the Board - The Chairman of the Board shall serve as the chief executive officer, shall preside at all membership and board meetings, and shall perform such other duties as may pertain to this office. The Chairman of the Board shall be an ex-officio member of all committees except the Nominating Committee. B. Vice Chairman of the Board - The Vice Chairman of the Board shall assist the Chair in such matters as the chair requests and shall perform the duties of the Chairman of the Board in the absence or unavailability of that officer. The Vice Chairman of the Board is also responsible for implementing, overseeing and scheduling orientation sessions as needed for incoming board members, officers and committee heads. C. Treasurer - The Treasurer of the Chamber may co-sign checks as authorized by the Executive Committee and as needed for any disbursement over $1000 other than payroll. The Treasurer shall be the technical custodian of all funds of the Chamber and shall present the financial report to the Board of Directors and provide timely assistance to the board for financial budgeting, planning and management. An Annual Financial Report shall be made available to the members upon request. The Treasurer shall chair the Finance Committee of the Board, and shall possess financial and/or accounting expertise. The Treasurer is responsible to oversee efforts to insure that all state and federal tax filings are made properly and in a timely manner. D. Secretary - The Secretary shall record and preserve the minutes of all regular and special meetings of the Chamber, and perform such other duties as may pertain to this office or as may be imposed by the Board of Directors. He/She will be responsible for submitting the minutes to the Board/Membership for approval and shall post on the website. 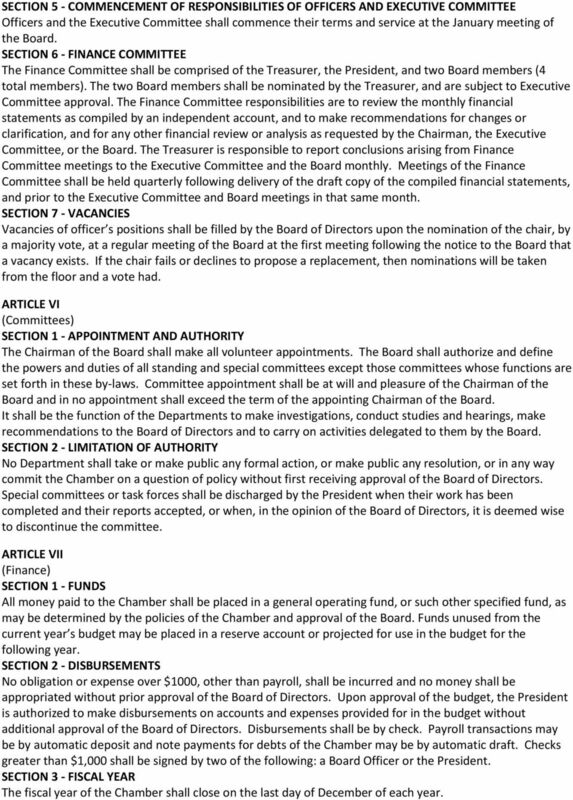 SECTION 4 - EXECUTIVE COMMITTEE The Executive Committee shall consist of the Chairman of the Board, Vice Chairman of the Board, Treasurer, the immediate past Chairman of the Board, and the President, as a non-voting member. The Executive Committee shall act for the Board of Directors between regular meetings of the Board on an as needed basis in case of an urgent situation or in the absence of a quorum, except with respect to Article IX, Section 1. Actions of the Executive Committee shall be within the policies of the Board of Directors. All actions taken by the Executive Committee shall be presented at the next following Board of Directors meeting for ratification. 8 SECTION 5 - COMMENCEMENT OF RESPONSIBILITIES OF OFFICERS AND EXECUTIVE COMMITTEE Officers and the Executive Committee shall commence their terms and service at the January meeting of the Board. SECTION 6 - FINANCE COMMITTEE The Finance Committee shall be comprised of the Treasurer, the President, and two Board members (4 total members). The two Board members shall be nominated by the Treasurer, and are subject to Executive Committee approval. The Finance Committee responsibilities are to review the monthly financial statements as compiled by an independent account, and to make recommendations for changes or clarification, and for any other financial review or analysis as requested by the Chairman, the Executive Committee, or the Board. The Treasurer is responsible to report conclusions arising from Finance Committee meetings to the Executive Committee and the Board monthly. Meetings of the Finance Committee shall be held quarterly following delivery of the draft copy of the compiled financial statements, and prior to the Executive Committee and Board meetings in that same month. SECTION 7 - VACANCIES Vacancies of officer s positions shall be filled by the Board of Directors upon the nomination of the chair, by a majority vote, at a regular meeting of the Board at the first meeting following the notice to the Board that a vacancy exists. If the chair fails or declines to propose a replacement, then nominations will be taken from the floor and a vote had. ARTICLE VI (Committees) SECTION 1 - APPOINTMENT AND AUTHORITY The Chairman of the Board shall make all volunteer appointments. The Board shall authorize and define the powers and duties of all standing and special committees except those committees whose functions are set forth in these by-laws. Committee appointment shall be at will and pleasure of the Chairman of the Board and in no appointment shall exceed the term of the appointing Chairman of the Board. It shall be the function of the Departments to make investigations, conduct studies and hearings, make recommendations to the Board of Directors and to carry on activities delegated to them by the Board. SECTION 2 - LIMITATION OF AUTHORITY No Department shall take or make public any formal action, or make public any resolution, or in any way commit the Chamber on a question of policy without first receiving approval of the Board of Directors. Special committees or task forces shall be discharged by the President when their work has been completed and their reports accepted, or when, in the opinion of the Board of Directors, it is deemed wise to discontinue the committee. ARTICLE VII (Finance) SECTION 1 - FUNDS All money paid to the Chamber shall be placed in a general operating fund, or such other specified fund, as may be determined by the policies of the Chamber and approval of the Board. Funds unused from the current year s budget may be placed in a reserve account or projected for use in the budget for the following year. SECTION 2 - DISBURSEMENTS No obligation or expense over $1000, other than payroll, shall be incurred and no money shall be appropriated without prior approval of the Board of Directors. Upon approval of the budget, the President is authorized to make disbursements on accounts and expenses provided for in the budget without additional approval of the Board of Directors. Disbursements shall be by check. Payroll transactions may be by automatic deposit and note payments for debts of the Chamber may be by automatic draft. Checks greater than $1,000 shall be signed by two of the following: a Board Officer or the President. SECTION 3 - FISCAL YEAR The fiscal year of the Chamber shall close on the last day of December of each year. 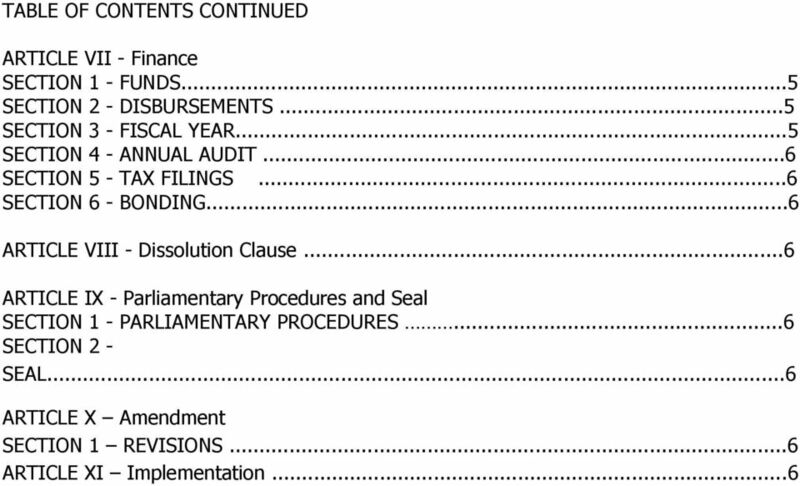 9 SECTION 4 - ANNUAL AUDIT The financial statements of the Chamber shall be audited, reviewed or compiled by a Certified Public Accountant annually, or as soon as is practical, after the close of the fiscal year. The audit, review or compilation shall be presented to the Board at the next regular Board meeting following receipt of the report, and shall thereafter at all times be available for review by members of the organization within the offices of the Chamber during the Chamber officers regular hours of operation. The Chamber shall engage the services of a CPA to compile the Chamber's financial statements on a quarterly basis to be delivered to the Finance Committee prior to its scheduled monthly meeting. 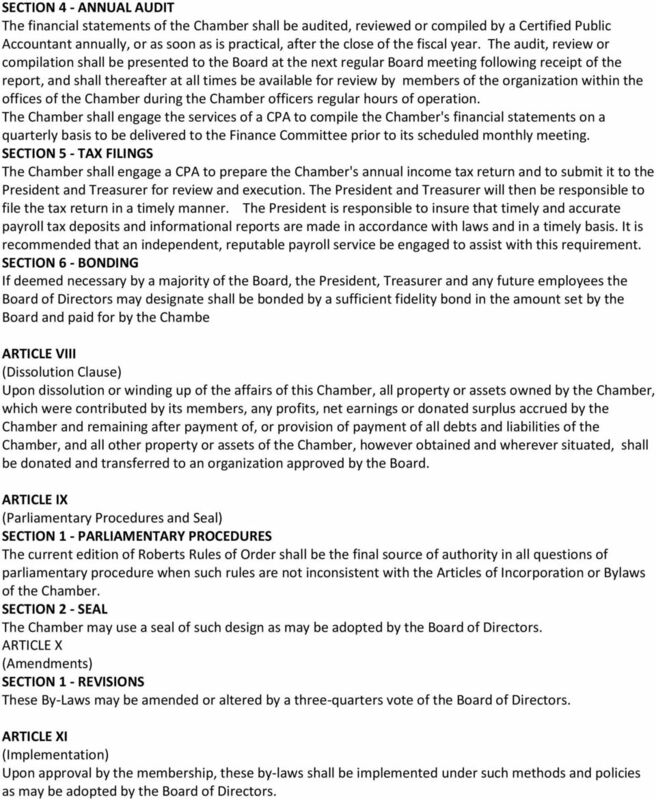 SECTION 5 - TAX FILINGS The Chamber shall engage a CPA to prepare the Chamber's annual income tax return and to submit it to the President and Treasurer for review and execution. The President and Treasurer will then be responsible to file the tax return in a timely manner. The President is responsible to insure that timely and accurate payroll tax deposits and informational reports are made in accordance with laws and in a timely basis. It is recommended that an independent, reputable payroll service be engaged to assist with this requirement. SECTION 6 - BONDING If deemed necessary by a majority of the Board, the President, Treasurer and any future employees the Board of Directors may designate shall be bonded by a sufficient fidelity bond in the amount set by the Board and paid for by the Chambe ARTICLE VIII (Dissolution Clause) Upon dissolution or winding up of the affairs of this Chamber, all property or assets owned by the Chamber, which were contributed by its members, any profits, net earnings or donated surplus accrued by the Chamber and remaining after payment of, or provision of payment of all debts and liabilities of the Chamber, and all other property or assets of the Chamber, however obtained and wherever situated, shall be donated and transferred to an organization approved by the Board. ARTICLE IX (Parliamentary Procedures and Seal) SECTION 1 - PARLIAMENTARY PROCEDURES The current edition of Roberts Rules of Order shall be the final source of authority in all questions of parliamentary procedure when such rules are not inconsistent with the Articles of Incorporation or Bylaws of the Chamber. SECTION 2 - SEAL The Chamber may use a seal of such design as may be adopted by the Board of Directors. ARTICLE X (Amendments) SECTION 1 - REVISIONS These By-Laws may be amended or altered by a three-quarters vote of the Board of Directors. ARTICLE XI (Implementation) Upon approval by the membership, these by-laws shall be implemented under such methods and policies as may be adopted by the Board of Directors. Community Associations Institute of Georgia, Inc. Section 1.03 The LCPD is governed by a three-part structure: The General membership, the Leadership Team and the Executive Board.